THE HOBBIT: THE DESOLATION OF SMAUG. I'm as shocked as anyone else that I legitimately enjoyed this second installment in Peter Jackson's tripartite adaptation of the Tolkien novel. An Unexpected Journey managed to both leave me cold and stoke the fires of my indignation. 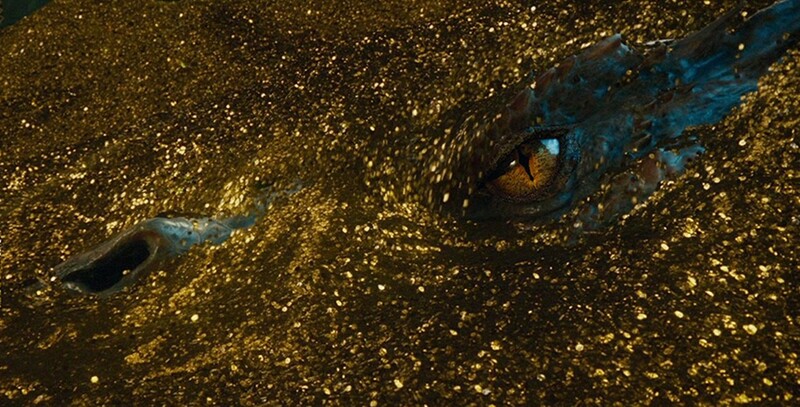 But where it felt meandering, dull and largely pointless, Smaug excites and charms. Again, I did not expect to feel this way; I could take or leave the Lord of the Rings movies, and the first Hobbit only struck me as more of the same. But somehow, this one feels to me like a refreshing new beginning. The movie opens with a flashback to one year before the events of Journey. Thorin Oakenshield (Richard Armitage) travels alone to a nasty little border settlement. Just before he is beset by assassins, Gandalf the Grey (Ian McKellen) joins him at table. The wizard's formidable presence is enough to ward off the ne'er-do-wells, and in their absence he convinces Thorin to undertake an unexpected journey to reclaim his ancestral throne. It's an important scene, if a little narratively jarring at first, because it hints at Gandalf's insight that there is more at stake here than a mountain kingdom filled with gold. A thorough plot summary would take nearly as long to spool out as the running time of the movie, and it would gut some of the fun, so I'll leave that to someone else. But the story sets off in a headlong rush following the initial expository scene and never drags. Where the plot of the first movie plodded along, languishing in tiresome dialogue scenes, Smaug constantly incorporates surprising turns, new characters and exciting action. The giant spiders make an appearance early on, followed by the introduction of woodland elves not entirely sympathetic to the plight of our travelers. The crisis of conscience born of Bilbo's possessing the ring starts to take on real significance, and the dwarves begin to develop distinct identities. Midway through, Gandalf parts company with Bilbo et al. to pursue his own mysterious investigation. This gives us a payoff for his initial meeting with Oakenshield, as it becomes clear that a conflict with potentially devastating consequences is in the offing. And we finally get to see the titular dragon voiced by Benedict Cumberbatch. He's pretty cool. I felt a little cheated by Journey, as if Jackson just needed an excuse to revisit the Middle Earth. But I am willing to admit that maybe I should have been more patient. Taken together, Smaug plays like a natural progression. The first section established setting and tone and the second plunges us into the fray. (I'm still not sure that each one needs to be almost three hours long, but most people don't seem to mind). I'll remain a skeptic, as I'm not entirely convinced that the filmmakers have my best interest in mind, but I'm cautiously optimistic. This is a marked improvement, and has in it some of the most exciting action sequences of the year. (I couldn't help but beam broadly during the barrels-on-the-river orc battle set piece). The storytelling is tauter, more concise and seeded liberally with real drama and loss. The immersive, huge-scale movie-making that can be the best and most frustrating thing about Peter Jackson is on proud display here, and I like it. PG13. 161m. THE BOOK THIEF clocks in a full 30 minutes shorter than Smaug, but feels easily twice as long. It is overtly sentimental, underdeveloped and insubstantial. It wastes a talented cast, a potentially interesting, if mostly tragic, story and some compellingly atmospheric design elements. But these attributes are only frustrating glimpses of possibility amidst the vacuous wreckage of the movie as a whole. Just before the outbreak of World War II, a young German girl named Liesel (Sophie Nélisse), is sent by her mother to live with foster parents. Liesel's little brother dies on the journey, leaving her with only a picture of him and a book purloined from a grave-digger as mementos of her family. She's teased mercilessly at school for her inability to read, so her adoptive father Hans (Geoffrey Rush) teaches her to read and to love words. Her no-nonsense foster mom Rosa (Emily Watson) struggles to keep food on the table. As nationalistic fervor and continental conflict escalate, the family harbors a young Jewish man who further encourages Liesel's love of literature. It also puts the family in harm's way, and a number of characters come to a bad end. I'm informed by my more widely read wife that The Book Thief is based on a very popular young adult novel, and this at once makes sense and dismays me. The movie can't seem to decide whether it's an Oscar-bait period drama or a tearjerker for kids. Nélisse is obviously a talented actress, but she's just pantomiming reactions to all the tragic goings-on around her. Given better preparation and direction, I don't doubt she could carry a darker, more substantial story. But this thing is all half measures and can't make up in set-dressing what it lacks in narrative substance. And it's narrated, in a haphazard way, by Death. It's all over the shop emotionally and aesthetically, and nothing about it works as it should. PG13. 131m. AMERICAN HUSTLE. Con artists, FBI agents and bad hair all around in this comedy caper based on the Abscam sting operation. With Bradley Cooper and Amy Adams. R. 138m. ANCHORMAN 2: THE JOURNEY CONTINUES. Will Ferrell dons the red polyester suit and keeps it classy in New York City as Ron Burgundy, the man behind the glass of scotch. PG13. 119m. SAVING MR. BANKS. Tom Hanks and Emma Thompson in a Disney movie about Walt Disney making a Disney movie. PG13. 125m. WALKING WITH DINOSAURS. Prehistoric CG fest about a runt in a migrating dinosaur herd. Voiced by Charlie Rowe and Karl Urban. PG. 87m. DALLAS BUYERS CLUB. Matthew McConaughey sacrifices his abs and gives a top-notch performance as an ailing, HIV-positive bull rider who smuggles treatment drugs. With Jared Leto. R. 117m. THE DELIVERY MAN. A subdued Vince Vaughn sires 533 children and it's not a horror movie — just disappointing without his manic edge. With Chris Pratt as his doughy foil. PG13. 103m. THE HUNGER GAMES: CATCHING FIRE. Katniss and Peeta are back in the dystopian fray. The actors are game, but with a sanitized production, the odds are not in their favor. PG13. 146m. OUT OF THE FURNACE. Troubled bare-knuckle boxer Casey Affleck disappears, leaving his brother Christian Bale to find him in this gritty tragedy that is almost masterful. Woody Harrelson puts out his joint and gets downright villainous. R. 116m.R. 116m. PHILOMENA. Steve Coogan helps former teen mom Judi Dench track down the son who was taken from her as a baby. PG13. 98m. THOR: THE DARK WORLD. Son of Odin! Hot Norse gods and CG effects everywhere, but not a viable story in sight. PG13. 112m. TYLER PERRY'S A MADEA CHRISTMAS. With nobody to stop him, auteur Perry is back in drag for a holiday trip to the sticks. PG13. 112m.